The Great Ohio flood of 1884. Two major storms in different parts of the United States changed the mindset of Writer and Activist for Native Americans Charles Fletcher Lummis. On February 4, 1884, a heavy rain began to fall on Chillicothe, Ohio, where Charles Fletcher Lummis lived and worked as an editor of the weekly newspaper, the Chillicothe Leader. 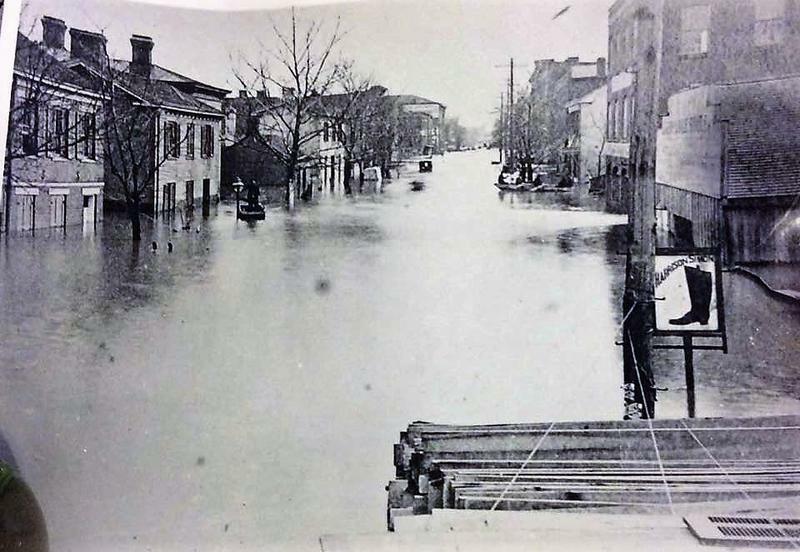 After thirty hours of continuous rain, the Scioto River, which runs through the city, began overflowing its banks, creating the worst flooding the city had ever known. 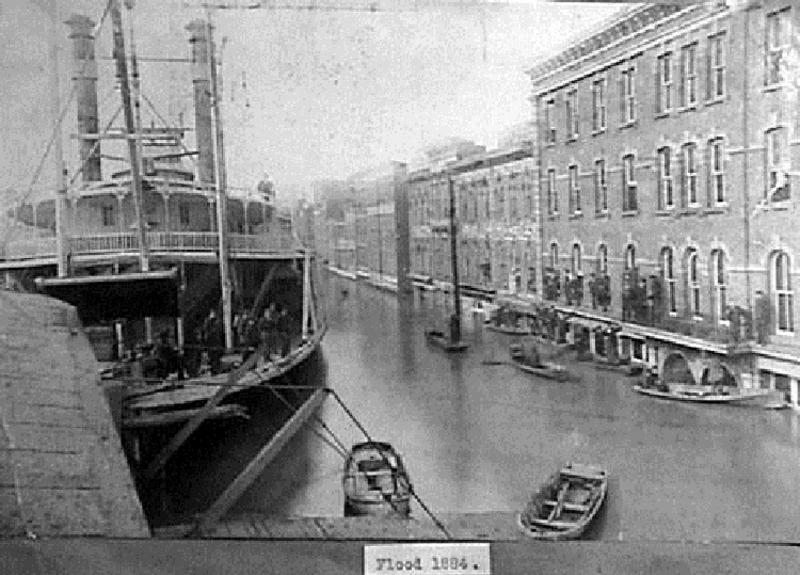 Flooded riverfront of Portsmith, Ohio in 1884. It had been an unusually cold winter, without a customary January thaw. The snow and ice on the ground held much water back from the surging river, but when the rain ended, the ice and snow melted and released a second flooding. Normally a mosquito filled area, mosquitoes now swarmed after the flood, bringing malaria throughout the region. In his book A TRAMP ACROSS THE CONTINENT, Lummis jokes that the train conductor would call out “Chillicothe! 15 minutes wait for quinine”! Chillicothe, Ohio in 1884 was not a healthy place to live. Lummis had lived in Ohio for two years, and was now wondering if he would have a long life in this unhealthy atmosphere. Fortunately, Lummis was saved by a fellow Ohioan, who had traveled West to make his life in Los Angeles, California. Harrison Gray Otis had purchased a quarter interest in a fledgling 4-page newspaper serving the small town of Los Angeles, then with a population of around 12,000 persons. After 2 years, Otis found himself overworked, doing everything himself, from writing to typesetting. He needed help. Otis offered Lummis the job of Editor of the Los Angeles Times and Lummis decided to head West. Railroad transportation in 1884 was fairly advanced. Lummis could have taken the Cleveland, Columbus, Cincinnati and Indianapolis Railway from Chillicothe, Ohio to Chicago, Illinois. 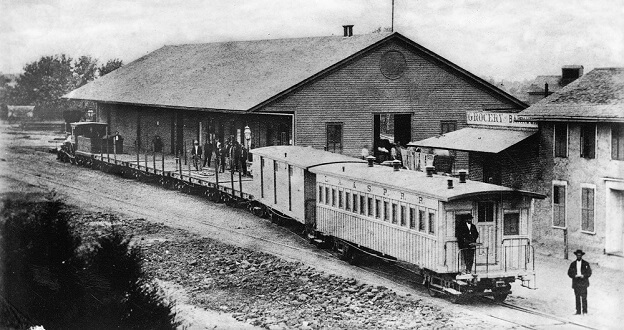 Los Angeles train depot in 1869. Lummis could have taken the train to Los Angeles in 1884. From Chicago he could take the Atchison, Topeka & Santa Fe Railroad through Kansas City directly to Los Angeles. But instead of taking the train, Charles Fletcher Lummis decided to walk across the whole country to California! It was more than 3,500 miles to Los Angeles. Lummis thought that walking would allow him to see America, and, along the way, write stories of his adventures for both the Los Angeles Times and the Chillicothe Leader. Lummis did cleverly use the railroads in one way: He mailed his dispatches by rail to the Times, which would publish his stories as he traveled West. “LUMMIS LEGS: Sixty three miles already traversed and only Three Thousand One Hundred and Thirty Seven yet to walk”. 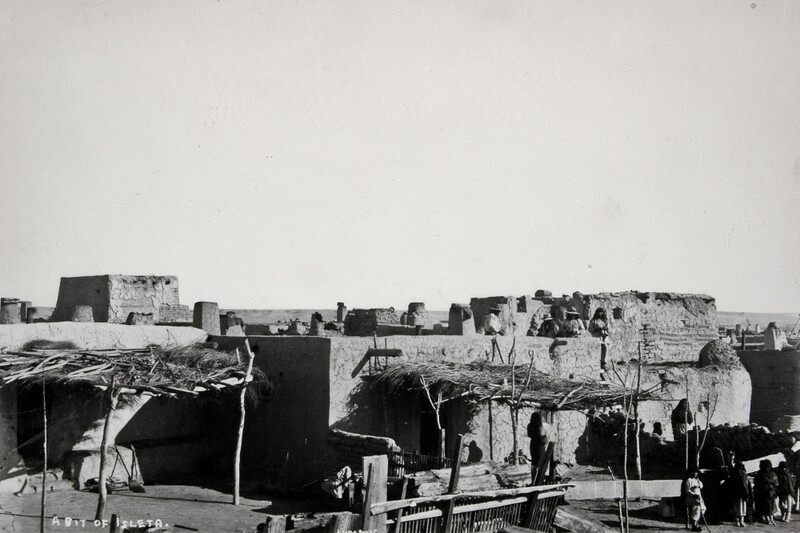 New Mexico Native American Pueblo Isleta in this photograph taken in 1884 by Charles Fletcher Lummis. Lummis’ descriptions of America during this transitional time are amazing and filled with adventures and humor. He walked West to Colorado and then Southwest across The Great American Desert to the totally different world of New Mexican pueblos, giving him a new understanding and respect for Native Americans that totally changed his life. Several years after this momentous trip, Lummis suffered a stroke from overwork and became partially paralyzed. In desperate need of a quiet place to recuperate, he chose Isleta, one of the New Mexican Native American pueblos. There, he was slowly nursed back to health by a friendly Tiwa family, with whom he had made friends. As he recuperated, Lummis became aware of the Federal Government’s treatment of Native Americans, forcing children to give up their Native American customs. Lummis became an activist for Native American rights. 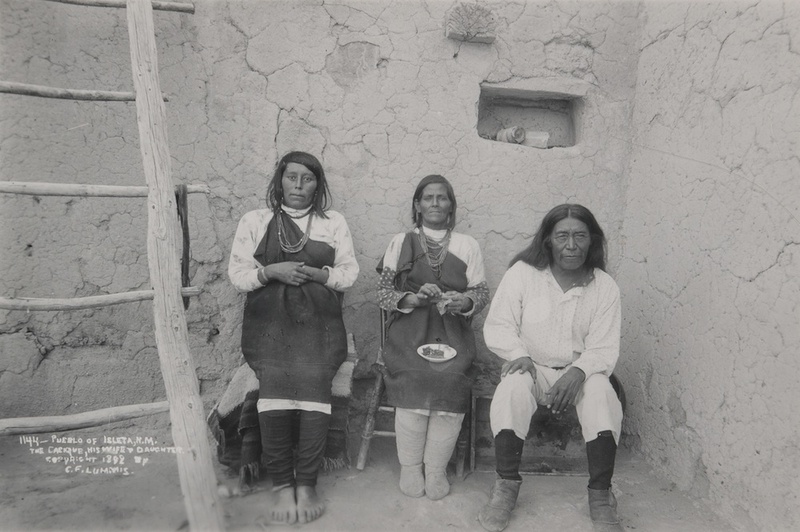 When he returned to Los Angeles, Lummis founded the Southwest Museum, devoted to an appreciation of Native American arts, basketry and culture. All of this, however, was in the future. 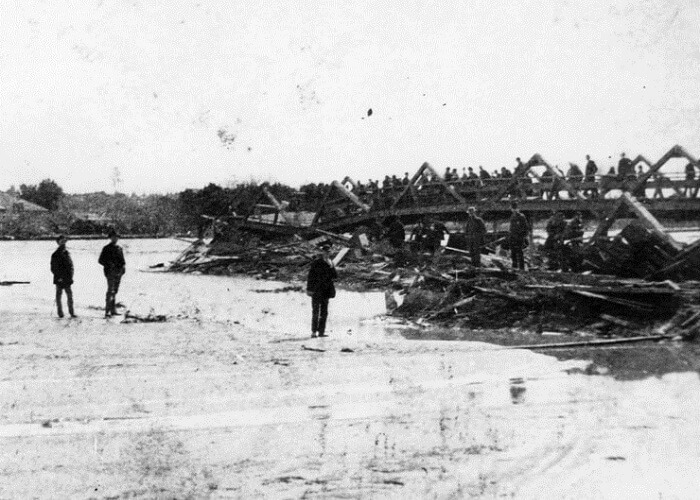 First Street Bridge over the flooded Los Angeles River is washed out in 1884 storm. As Lummis walked through the heat of the desert in 1884, he had no idea that a disastrous winter rainstorm had inundated Los Angeles and Southern California, almost at the same time as the storm in Ohio. According to Los Angeles Times records, the El Rancho Hacienda, the estate of the last governor of Mexican California, Pio Pico, in Whittier, was destroyed. Pico had to mortgage his other properties to rebuild it. Examining Lummis’ book, I was able to trace his route in California on a current map of California, starting at the town of Dagget in the Mojave Desert. Lummis’ path leads up the mountains, through the Cajon Pass in the San Bernardino Mountains. When he finally reached the seaward side of the mountains, Lummis was astonished at what he saw. For Californians like me, Lummis could be describing our wildflower-covered hillsides after super heavy rainstorms like El Nino. 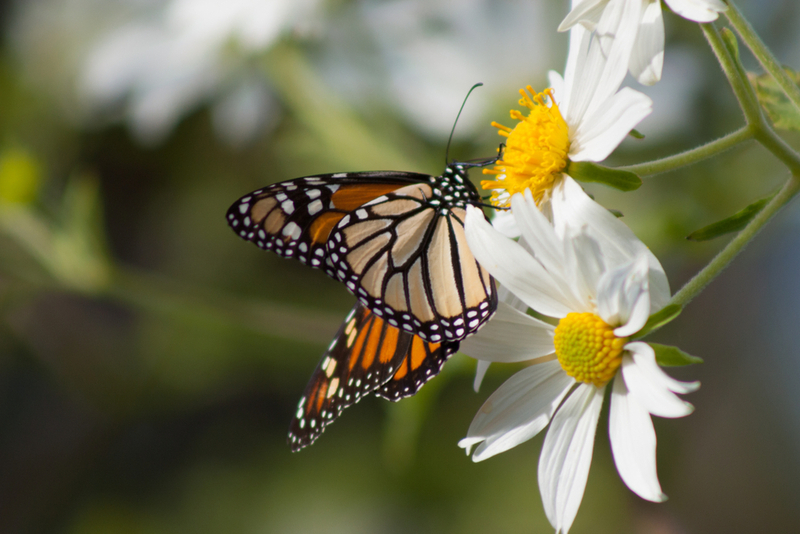 Plant life, dormant during Southern California’s lengthy droughts, springs to life after our infrequent rainstorms. Lummis thought all this was normal. He thought this is the way California always is. 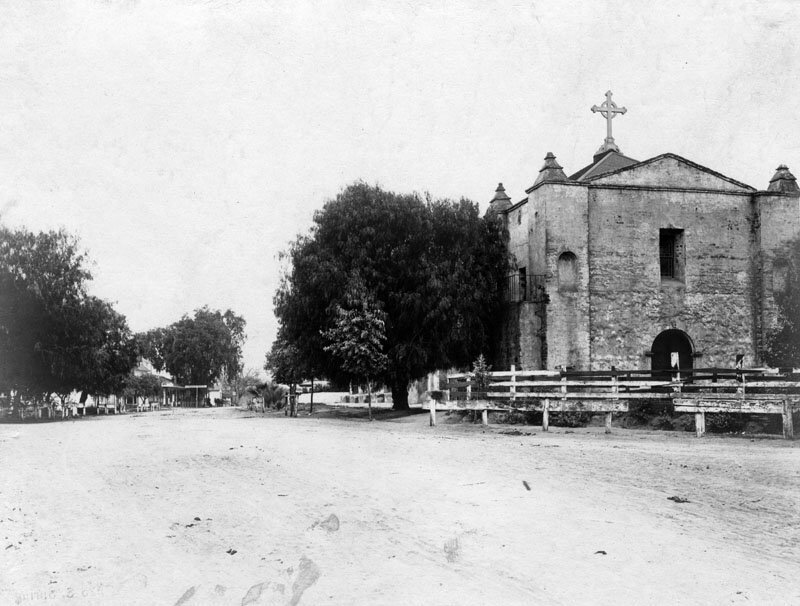 Mission San Gabriel late 1800’s. Lummis walked to Mission San Gabriel and met his new employer, the hard working Harrison Grey Otis, who came out the eight miles from Los Angeles to meet him. Lummis looked a wreck, but the two men got on just fine and Lummis began editing the Los Angeles Times the very next morning, February 1, 1885. After crossing the country, Lummis wound up in what seemed to him a rain nurtured land, beautiful and fruitful. He had met Native Americans, whose culture would nurture his body and spirit in his time of need. 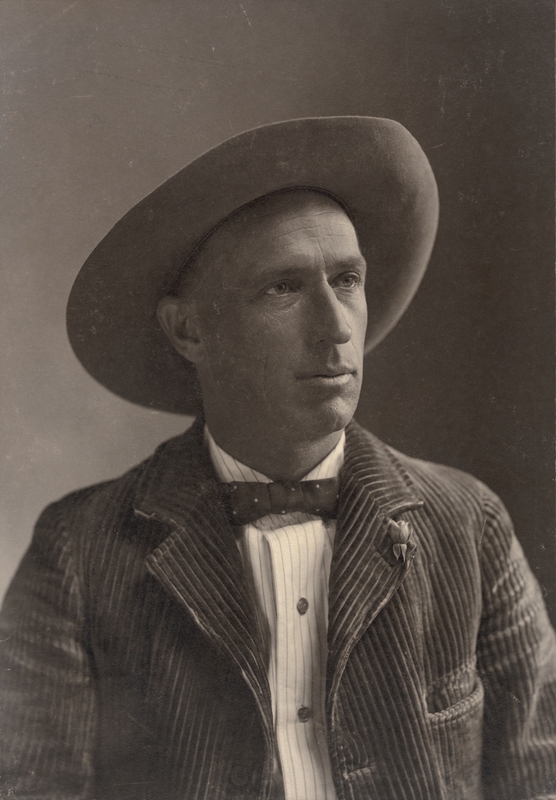 He had discovered a vision of the American West and decided to stay. 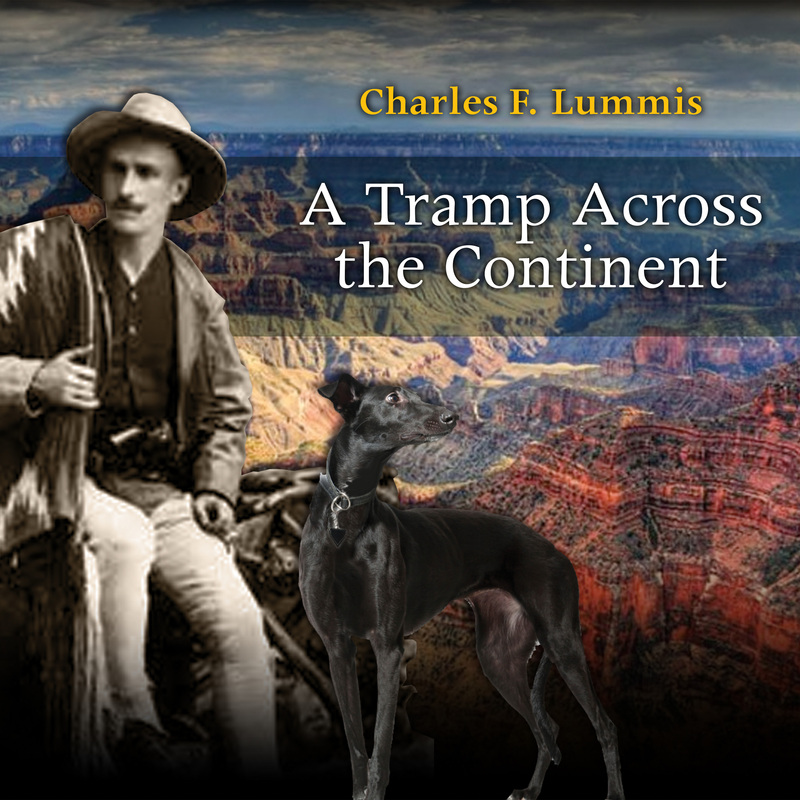 A TRAMP ACROSS THE CONTINENT by Charles Fletcher Lummis has become world famous. I have narrated it as an audiobook for Listen2Read audiobooks. When you have downloaded and listened to his tale, I think you will agree with his many fans that Lummis is a fascinating American writer. A TRAMP ACROSS THE CONTINENT is available for download into your smartphone or computer here at Listen2Read.com, or at Audible.com, GooglePlay.com, I-Tunes.com, the Barnes and Noble Audiobook app, Scribed.com, and in Canada at Tune-in.com. You can purchase a regular or Mp3 CD version right here on our Listen2Read website or on Amazon.com.